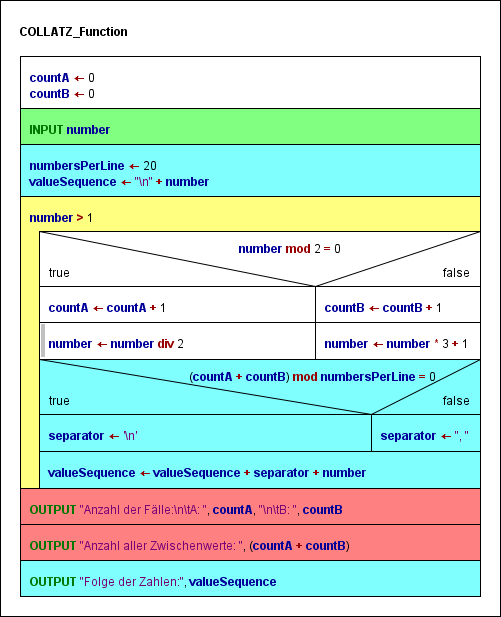 In order to regain overview in large diagrams you may collapse some elements, i.e. minimize their size to a small instruction-like rectangle. This is not a modification of the diagram (and won't be saved) but only a display modification. Hence, collapsing won't be registered in the undo list, either. Roll the mouse wheel upwards (if the respective mouse wheel mode is enabled). Roll the mouse wheel downwards (if the respective mouse wheel mode is enabled). 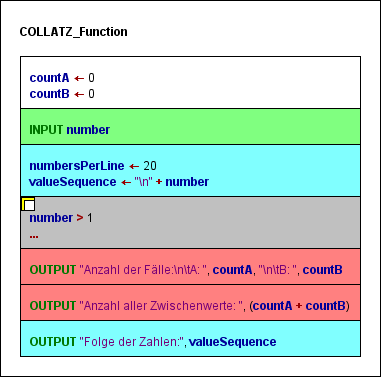 Note: Collapsing a structured element may change the displayed value of tracked run data or its representation but won't discard or modify the tracked data themselves. In the "Preferences => Mouse Wheel" submenu you can specify what effect the mouse wheel is to have within the Structorizer work area: If the toggle item is selected then rolling the wheel up or down will collapse or expand the currently selected element, respectively. Otherwise, moving the mouse wheel will scroll the Structorizer editor canvas vertically or (on most platforms), with the Shift key pressed, horizontally. A touchpad will work in the analogous way.